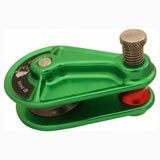 RP048 1/2" Compact Rigging Block w/ Spring Pin. 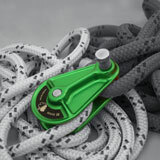 The latest addition to ISC's world-leading range of rigging pulleys is the new "Compact Block", suitable for lightweight rigging applications. 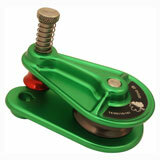 At approximately half the size of the standard small rigging pulley and weighing in at only 490g (1lb), the new compact rigging pulley offers a highly impressive strength to weight ratio, with an 85kN (19000lbs) MBS and WLL of 17kN (3800lbs). 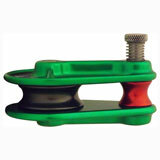 The Pulley plates are made from hot forged Aluminium and it is this manufacturing process which allows such a compact pulley to boast such great strength and dynamic load bearing capacity. 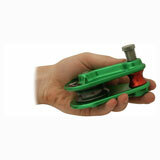 Spring-lock pin, with chamfered head yields quick, easy location and secure lock. 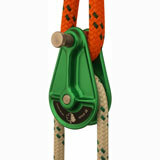 Wide, rounded cheek plates protects ropes to minimize wear. Color coded sheaves for quick easy sizing identification. Identifications plates with individually serial numbered make inspection tracking easy.